This space wallpaper from NASA's Spitzer Space Telescope shows infant stars "hatching" in the head of the hunter constellation, Orion. Astronomers suspect that shockwaves from a supernova explosion in Orion's head, nearly three million years ago, may have initiated this newfound birth. 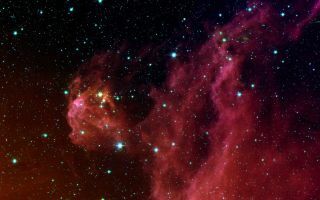 The region featured in this Spitzer image is called Barnard 30. It is located approximately 1,300 light-years away and sits on the right side of Orion's "head," just north of the massive star Lambda Orionis.